Muniments is the first UK solo show of the photographic and text installation work of the Iranian born British artist Afshin Dehkordi. Focusing on the tangled and contradictory relationships between Iran and the West, Muniments peels open the subtle layers of public and private ownership in contemporary Iranian society. The works display the underlying drama and construction of the ‘story,’ inherent within the language of journalism and an important concern within Muniments. A shift in awareness occurs as the mix between migration, architecture and borders reveals seductive social and personal ideals or longings that are sharply displaced from focus. The relationship to documentary and fiction is never quite separated in Muniments. We are shown through photographs and texts the special complexity of borders—that different kinds exist all around us and that the understanding of the border as a line or single place is perhaps obsolete. The exhibition is set within two spaces that hold an ambiguous physical edge to the photographs and the texts. From the mountains of Tafresh, to the urban cityscapes of Tehran and to the salt desert of Daryache-Namak. Muninents interest lies in the politics of appearance, in terms of tracing experiences, memories and histories that are rendered largely invisible and how this invisibility occurs in reality. This is the afterlife of Dehkordi’s migration between Iran and Britain and it calls attention to what extent that part of the journey is rendered visible and invisible. The exhibition appears to move between the surfaces of a personal use of utopia—not escapist or apolitical, but one where it becomes a critical force against the perceived reality that exists and the closed bi-cultural language of the past. Dehkordi was born in Iran in 1975. He studied Mathematics at University College London and Economics at Harvard. He has exhibited internationally, and cultivates his artistic practice alongside award-winning work for the BBC. 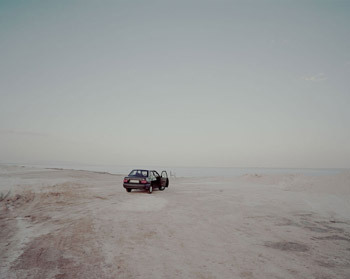 Dehkordi’s work is included in Black Dog Publishing’s Contemporary Art in The Middle East.